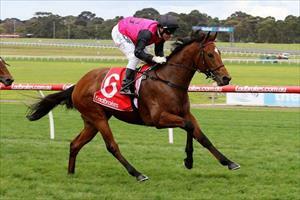 Barthelona is back in action at Sandown Hillside when he races there on Wednesday with conditions in his favour. The son of Zoffany has won previously at Sandown and is one of eight runners in the sixth race, the Tile Importer Handicap over 1000m with the track rated soft(6). The state of the track has Mike Moroney smiling. “He’s had three starts on the soft for two wins and a placing so the conditions are ideal,” Moroney said. Barthelona resumed with a third place finish at Bendigo over 1000m and Moroney said the four-year-old had legitimate reasons for not finishing closer. “He missed the start which put him out the back when we were anticipating being midfield,” Moroney said. “Then Patrick had to come the widest of all into the home straight and lost ground in the process so his effort under the circumstances was better than the form book says. “He’s trained on well since that run but he looks to have struck quite a strong field for a benchmark84. Patrick Moloney rides Barthelona, who will jump from barrier three after scratchings.